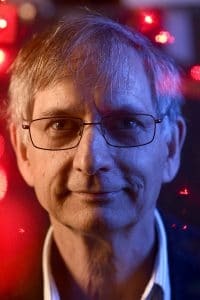 NC State physicist John Thomas has received two prestigious honors from the American Association for the Advancement of Science (AAAS) and the American Physical Society (APS). Thomas, the John S. Risley Distinguished Professor in the Department of Physics, was elected a fellow of AAAS, one of the nation’s most prestigious scientific honors. His election means the College of Sciences now has 14 AAAS fellows on its faculty. From APS, Thomas won the Davisson-Germer Prize in Atomic or Surface Physics, which comes with a $5,000 award. For both awards, Thomas was recognized for his seminal contributions to the study of unitary Fermi gases. These gases model exotic systems in nature, including high temperature superconductors, neutron star matter, and perfect fluid flow in quark-gluon plasmas, a state of matter than existed just after the Big Bang. Thomas has been on the NC State faculty since 2011. He earned his B.S. and Ph.D. in physics from the Massachusetts Institute of Technology.